Killings and deaths as unbearable as Jimmy Mubenga’s, in front of the passengers and crew of a British Airways aircraft, at Heathrow in 2010, are not only common in the ‘war on immigration,’ they are inevitable. His was one of at least 20 deaths in Britain’s immigration system; a figure dwarfed by the 17,000 who have died at Europe’s borders since 1993 - the year when immigration detention first began to grow in Britain. In September 2003, five of us set up No One Is Illegal, UK, to denounce claims made by the British Government that this system could be made ‘fair’ or ‘humane.’ The brutal language of politicians like Home Secretary David Blunkett openly belied any real concern to be humane. Moreover, it is physically impossible to stop people moving when they need to, without harming them or their families, especially if they are not rich. And incredibly, nobody has ever come up with a clear reason why this cruelty is necessary. To us, these laws are explicable only by racism, driven largely by the media, which successive governments have sought to appease. They have ended up undermining the rule of law itself, a fact which should concern everybody. As our manifesto puts it: 'Under all other laws it is the act that is illegal, but under immigration law it is the person who is illegal.' Literally and explicitly, people are now arrested and imprisoned, deported and abused and killed, or simply left to die in whatever way happens to befall them, just for being who they are, not for anything they may have done or even might do. Failing to challenge this nonsense involves failing to challenge a force that will happily destroy society and is doing so, and which we all recognise and were taught about in school: the force of arbitrary, authoritarian power; the mindset that believes that rules are more important than lives, and that defers to power and holds the weak in contempt; the 'hard-headed realist', 'cruel to be kind', 'tough choices' brigade that is also happy to cut benefits for the sick, drive down wages and destroy jobs—and then blame the poor for their own poverty, while pouring our money into aggressive foreign wars (and creating further refugees to demonise). Their hypocrisy cries out to be exposed. The tougher they talk, the further they distance themselves from the dirty work. The bigger the stench, the longer the chain of departments, directorates, sub-directorates, agencies, contractors and subcontractors separating the upright politician from the racist thugs with the shaved heads, enthusiastically implementing their policies. How can any society thrive which harbours and nourishes such an industry? The prison companies, the deportation companies, the special 'courts' (so-named only recently) where well-paid careers are to be had by the morally-confused but ambitious. And so on ... a monster that must be fed and fed and fed, as long as the tough-talking hypocrites continue to play the game they've embarked upon and now couldn't get out of even if they wanted to. What would happen, if we said ‘This emperor has no clothes’? What if we were to scrap these anti-immigrant laws? It’s extraordinary how little hard evidence anyone has found to justify the hysteria. We should be ashamed! Millions could probably have been raised from poverty with the money that's been spent on reports and books and articles debating whether the impact of scraping the laws would be beneficial to the economy or not, or if not to the economy, to 'social cohesion', or some other newly-discovered precious item that might possibly be affected. Let's just say it would probably be copeable-with. After all, we coped with foreigners before all these laws came along, which wasn't all that long ago. The problem, insofar as there has ever been one, is the racists, and the inequality that feeds racism. If we cannot quite bring ourselves to think of a world without borders, how about a world where borders do something useful? I would be proud to belong to a country within whose borders anybody who could get themselves here could feel safe at last, and cared for; a country where the hospitals and doctors treat you because you are ill, not because you are a national citizen; where the schools and universities educate you because you want to learn; a country whose representatives speak out clearly and forthrightly against tyranny and warmongering and the destruction of people's livelihoods wherever they are, and who use our collective resources to help people and fight injustice. If we are concerned about how much such an 'idealistic' setup would cost, why not question why so many things that used to be available when needed now have a financial cost? Let's take everything that is important to life, to people's health and happiness, back out of the money economy. To a surprisingly large extent, this would only mean going back a few years to the time before our public services acquired 'internal markets' - a time when the British National Health Service, for example, gave almost the best value for money in the world in terms of health outcomes. Which raises the exciting thought that a society with fewer price-tags is a lower-impact society (as suggested in Kate Pickett and Richard Wilkinson's recent book about inequality, The Spirit Level). Scrapping anti-immigrant laws, and following through the implications, could lead us to the sustainable future we all supposedly aspire to. But surely I am talking about socialism? Or communism or anarchism? My modest demand is a politics that respects people, which will not harm people without a very good reason. In fact, this is already supposed to be a basic principle of law. As the Royal College of Surgeons says on its letterhead: "First, Do No Harm". Or as the wise prince in Shakespeare's The Merchant of Venice put it (I paraphrase): "Do what the hell you like, as long as you do not spill one drop of blood". Is this 'politically realistic'? 'Hard-headed realists' often tell us that opposing immigration controls is politically impossible, because public opinion is now so implacably hostile to immigration. Indeed, the steady stream of anti-immigrant yarns over the years by the likes of the Daily Mail and the Murdoch press have had some effect: 'immigration' is now at or near the top of public concerns in public opinion surveys. This brings up two questions: first, since when does a grownup democracy crucify people 'by popular demand'? And second, do these polls really reflect what people think? We often ask the people we meet in shops, airports and elsewhere what they think about immigration controls. Almost always we get answers like: 'we ought to be able to go where we like: we're all humans!' We wondered whether perhaps the biggest political grouping in Britain might be the people who think they're the only ones in Britain who think immigration controls are mad. Two years ago, the extraordinarily principled company Lush Cosmetics financed a YouGov poll, to test a proposition drafted by No One Is Illegal: "People should be free to live and work wherever they wish, and enjoy all the same rights as all other residents. No One Is Illegal." 54% either agreed or strongly agreed. 31% had no clear opinion. Only 16% either disagreed or strongly disagreed. YouGov designed a subsidiary set of questions to tease out people's feelings about controls, and whether they should apply to everyone or just to other people. This showed somewhat higher support for controls, but with only a slight bias against foreigners, and nothing like the blanket opposition to immigration promoted by the media. So, at the very least, the public is much less clear on this issue than the media and the politicians say they are. There is room for debate. And it suggests that in spite of everything they've been put through these last thirty or so years, British people are still normal, sane people; not savages or fascists. That is consistent with the sense that many people have, that politics has left the people behind, in a whirl of heavily-armed paranoia and high-impact fantasy. 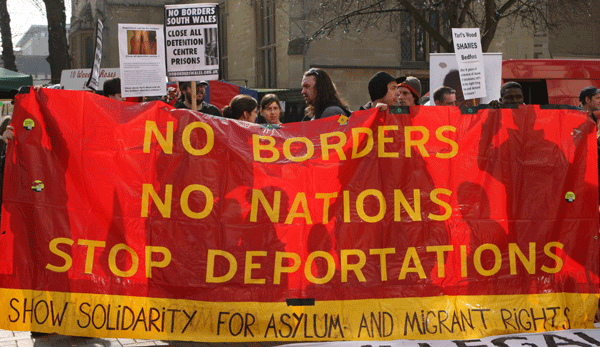 An Open Borders politics could be the start of public re-engagement with politics and a transformation of our political system.